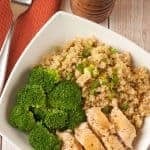 Drizzled with a tangy, lemon-pepper pan sauce, this easy, one-dish dinner is a healthy combination of lemon and garlic-marinated chicken breasts, quinoa, scallions and steamed broccoli. 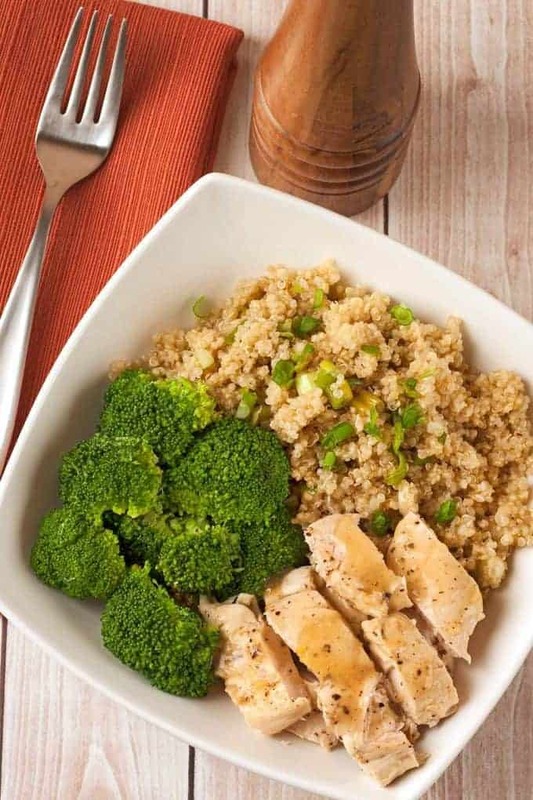 A healthy, one-dish quinoa bowl topped with lemon-marinated chicken breasts, steamed broccoli and a tangy lemon-pepper pan sauce. 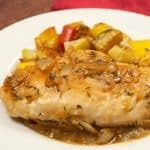 Place the chicken breasts between two sheets of plastic wrap and gently pound them to an even thickness of 1/2-inch. Season on both sides with salt and pepper and arrange on a large plate. In a small bowl, combine 1 tablespoon of the lemon juice with the olive oil, garlic and half of the lemon zest. Drizzle half of the marinade over the chicken and use the back of a spoon to spread it evenly over each piece. Turn the chicken over and repeat the process with the remaining marinade. Set aside at room temperature for 20 minutes. While the chicken marinates, prepare the quinoa. Using a fine-mesh strainer, rinse the quinoa thoroughly and set aside to drain. Cook, stirring occasionally, until the quinoa is tender and most of the broth has been absorbed, about 12 minutes. Stir in the butter and sliced scallions and season to taste with salt and pepper. Remove from the heat and set aside until ready to serve. Prepare the broccoli by placing about 1/2-inch of water in a sauté pan and bringing it to a boil. Add the broccoli and immediately reduce the heat to medium. Cover tightly and cook until the florets are tender, 4 to 6 minutes. Transfer the broccoli to a bowl, cover to keep warm and set aside. Wipe out the pan you cooked the broccoli in and place it over medium-high heat. Add the chicken in a single layer and cook until no longer pink in the center, 1-1/2 to 2 minutes per side. 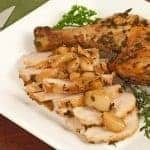 Transfer the chicken to a cutting board and deglaze the pan with chicken broth. Combine the cornstarch and water and add to the broth. Bring to a simmer and once the sauce starts to thicken, add the remaining 3 tablespoons of lemon juice and lemon zest. Stir to combine and cook until the sauce is the consistency of maple syrup, 30 seconds to 1 minute more. Remove from the heat and add a pinch salt and a generous amount of black pepper to taste. 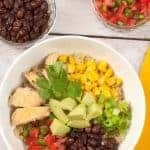 Fluff the quinoa with a fork and divide between 4 serving bowls. Slice the chicken breasts on the bias and place one atop each serving of quinoa. Add the broccoli to the bowls, then drizzle each with a portion of the sauce.